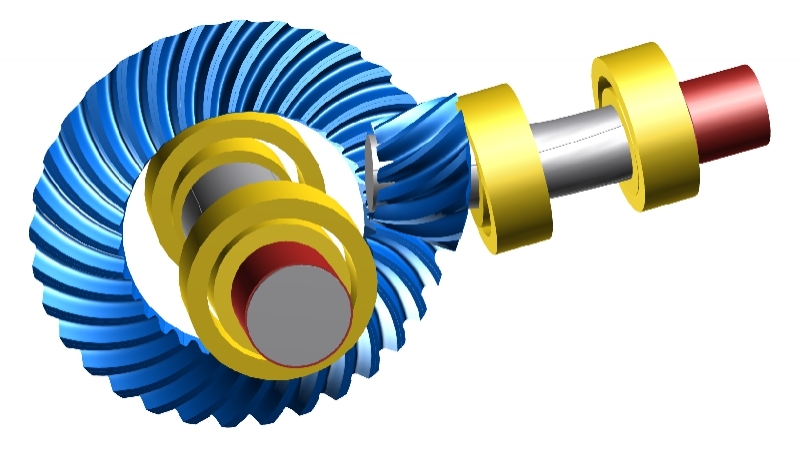 The relative position of the pinion and the ring gear is critical in determining the wear patterns of bevel gears. To determine the bevel gear misalignment, the displacements of the shafts can be directly determined in KISSsoft Release 03/2016 by linking the shaft files to the bevel contact analysis. The VHJ displacement values are defined from the respective ratios of the two shafts with regard to the pinion as well as the ring gear. This information is then taken into account in the contact calculation (module ZC30). The flank micro-geometry of bevel gears is dependent on the gear-cutting method which is used. The user can apply topological modifications using the topology of an existing bevel gear design. In KISSsoft (module ZC13) the running behavior of the bevel gears can then be checked using bevel gear contact analysis. Further applications using this module are the design of 3D models for the 5-axis milling process or for external FE studies. Would you like to learn more about the application of topological modifications of bevel gears in KISSsoft? Our instruction highlights the background and use of this method, which offers great potential for practice.